The making of an oxygen-free zone! So as far as concerns electron acceptors, the clear winner is always oxygen, so if any oxygen is present, it will always be used preferentially by any living organism in the vicinity. 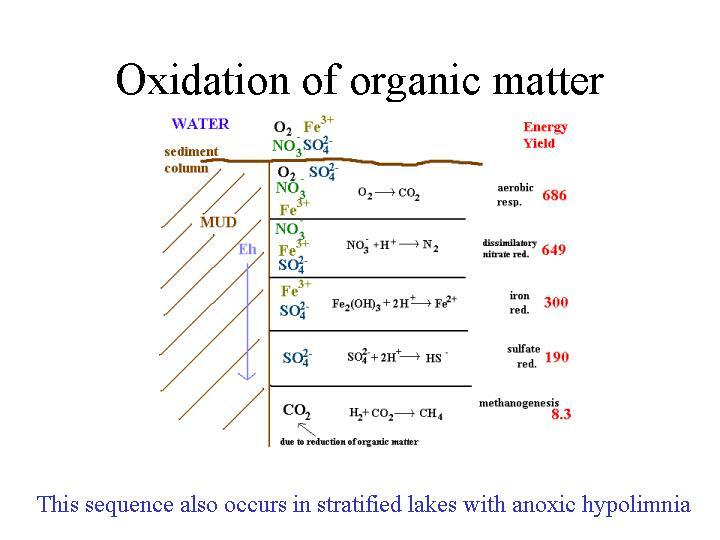 Wetland soils are definitionally waterlogged/saturated (at least part of the time), and because oxygen doesn’t move well through water, there is very little oxygen present under the water’s surface in these systems. 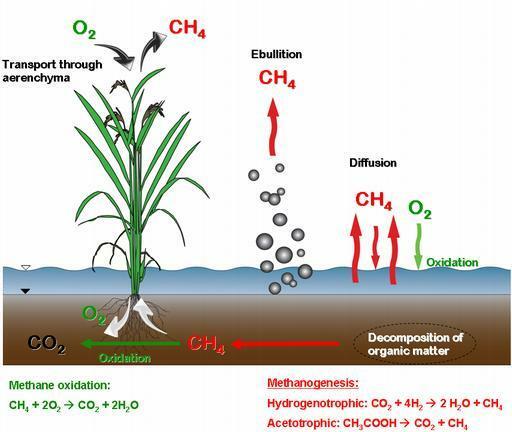 So microbes that live in wetland soils must use anaerobic respiration to make their energy, which means that they use one of many ‘alternative’ terminal electron acceptors. Common alternative electron acceptors (in order of descending energy yield per unit) are: nitrate, manganese, iron, sulfate, and last (and least) is carbon. And because life is hard, and energy is good, biogeochemical dogma states that soil microbes will use all of the best available electron acceptor before moving the next step down on the energetic ladder – aka: they’ll use up all the nitrate before starting in on the manganese, and so on. The last and lowest-energy-yielding option (using carbon compounds as the terminal electron acceptor) is the only way to make methane! Here is a lovely visualization of the ‘redox ladder’ (citation): You can watch the abundance and variety of electron acceptors disappear with depth (floating molecules on the left hand side), and the energy yield associated with each respiratory pathway (values in red down the right hand side) decrease as you get deeper. So what have we learned? That methanogenesis is one way for microbes to make energy in the absence of oxygen, and that it’s the least favorable option in terms of energy yield. AOM is super common in marine (ocean) systems, where there are lots of deep-ocean methane vents constantly bubbling methane out of the earth’s crust (and there’s no oxygen down that deep). AOM in the ocean consumes about 90% of the methane emitted, which is a really big deal. If AOM wasn’t happening, all that methane would bubble up to the surface, mix into the atmosphere, and that’d be a wrap on life as we know it. So props to marine AOM. A few decades ago, people (okay, just the scientists) started wondering about if non-marine systems were also performing AOM in places like anaerobic wetland soils. Fast-forward to me in graduate school. Here’s what we know: AOM has been ‘found’ in northern wetlands, but terrestrial AOM studies are limited, so there’s a lot we still don’t understand about what affects the productivity of the microbial populations that perform AOM. This is especially true in high boreal and Arctic ecosystems, which is where I work! 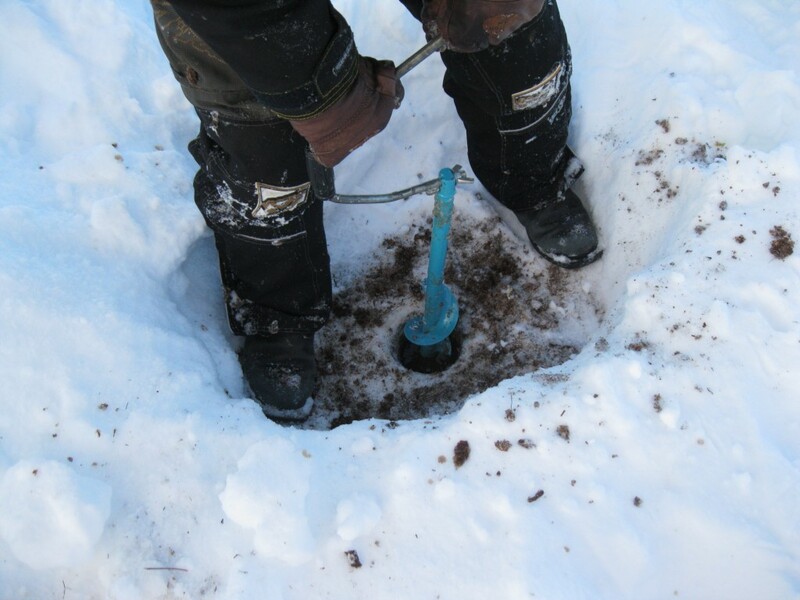 To this end, I am here in Kuopio, Finland conducting an experiment using a modified stable isotope pool dilution technique that allows me to take a chunk of soil and measure the rates of both methanogenesis and AOM! You should be suitably impressed, and if you want to know more, here’s the scientific article that got me interested in AOM back in 2009. 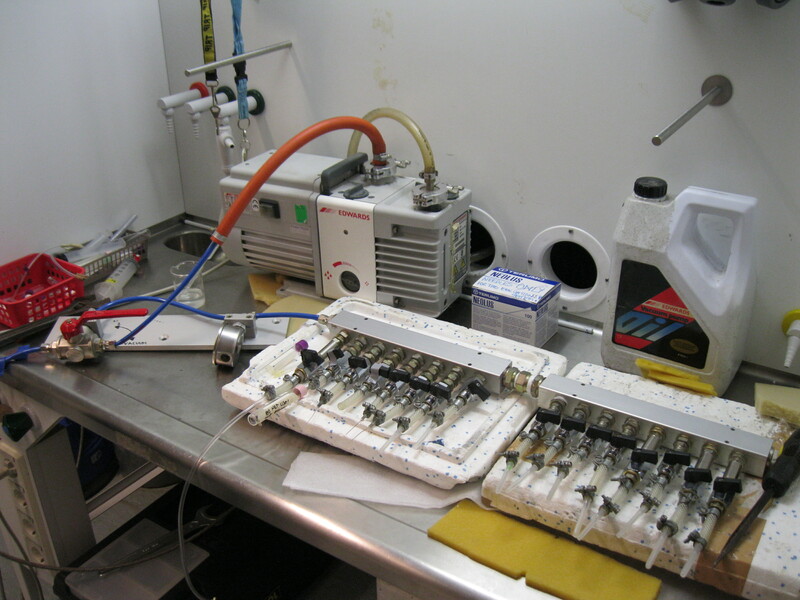 It contains a stable isotope pool dilution experiment that I base mine on: Smemo and Yavitt, 2007. To do this experiment, I have to incubate the soils in an anaerobic environment (meaning absolutely no oxygen present), which is when logistics get fun/interesting/infuriating. 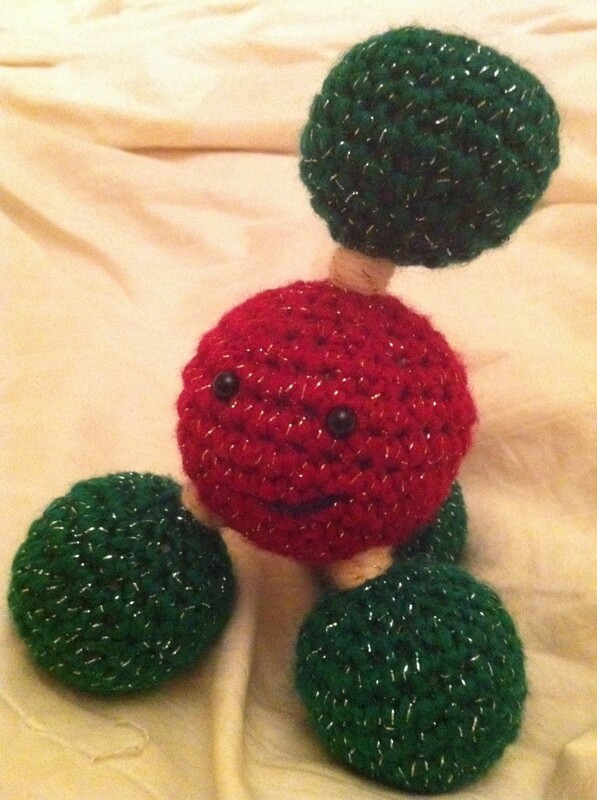 So welcome along, as I show you exactly what I did to get this experiment going, and keep it oxygen-free! And in case you’re unfamiliar with them, this is a 3-way stopcock: The red, 3-spiked bit rotates 360-degrees, and allows for air flow in any direction that one of the spikes is pointing (so the flat side is a permanently ‘closed’ position). 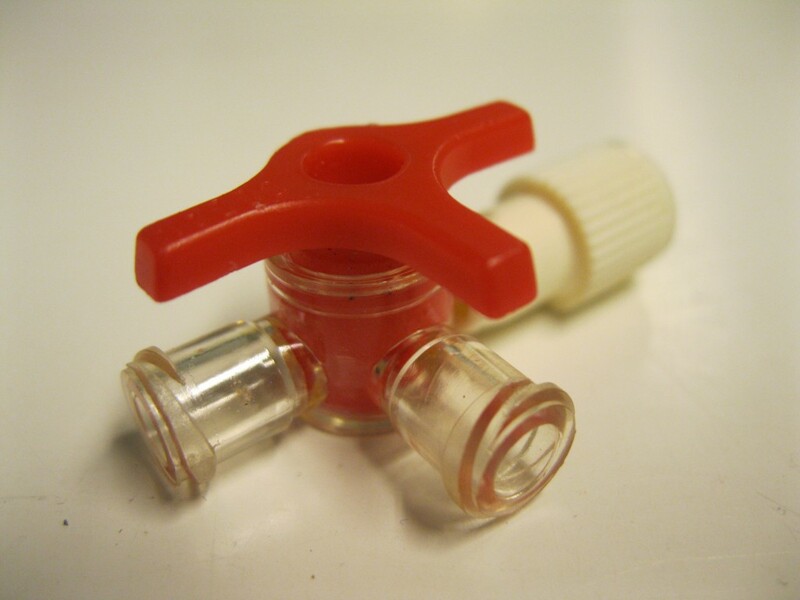 The clear and white bits are where you can attach syringes, needles, or other stopcocks (like those in the jar lids). It takes a bit of face scrunching, but once you get the hang of these, they become your best friends. With a tightened lid and closed stopcocks, you have yourself a gas-tight incubation chamber! 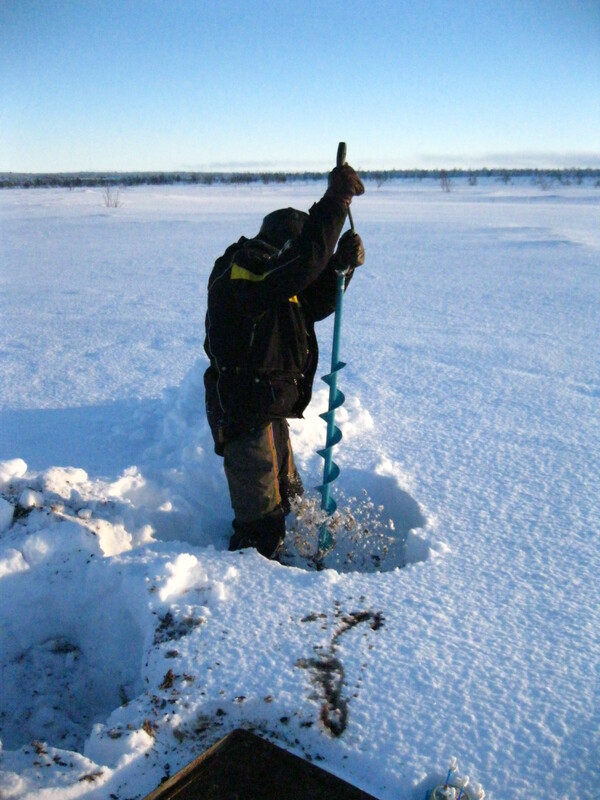 Esa and I extracted 10 soil cores from various locations along my transects in Petsikko. 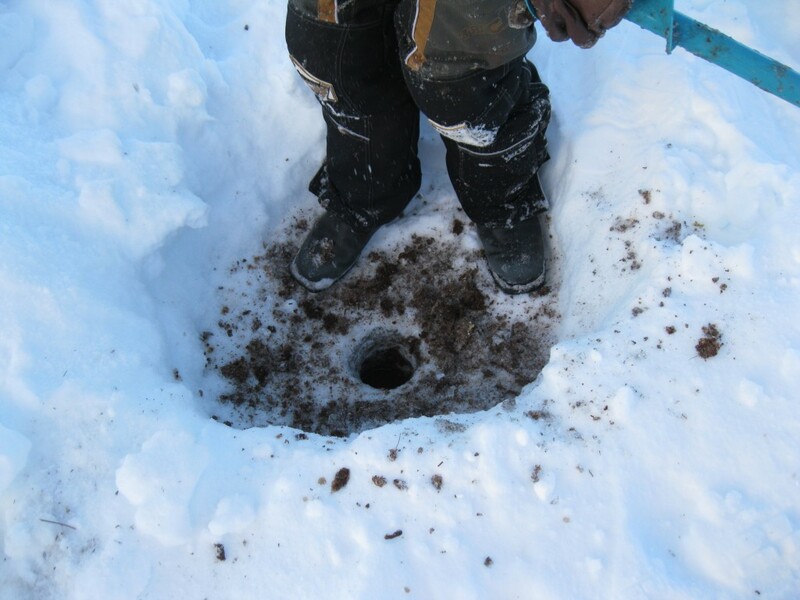 This consisted of Esa augering a hole through the frozen ice layer on top of the unfrozen peat soil (yeah, it never did end up freezing more than a few centimeters into the actual soil). 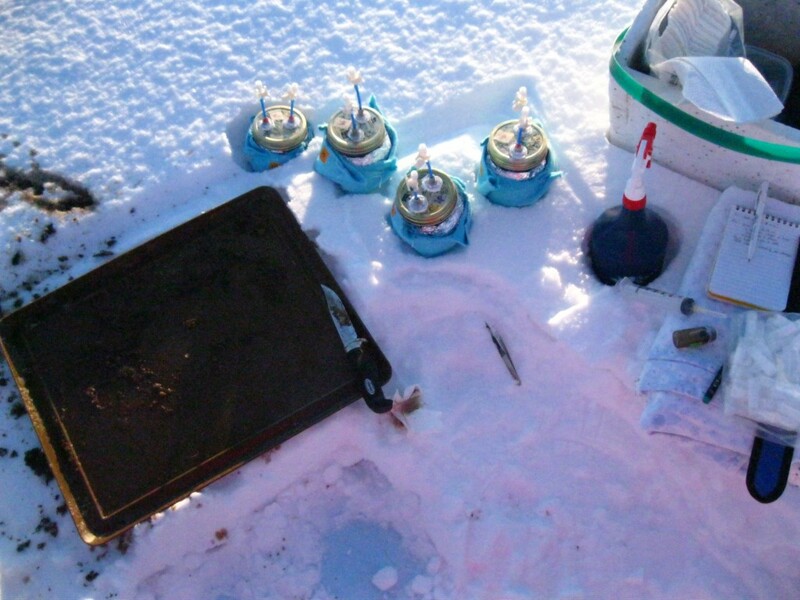 I prepared and brought with me the necessary equipment for assembling the soil incubation chambers directly in the field – this was the best way to protect the non-frozen peat soils from exposure to oxygen prior to the start point of the experiment. 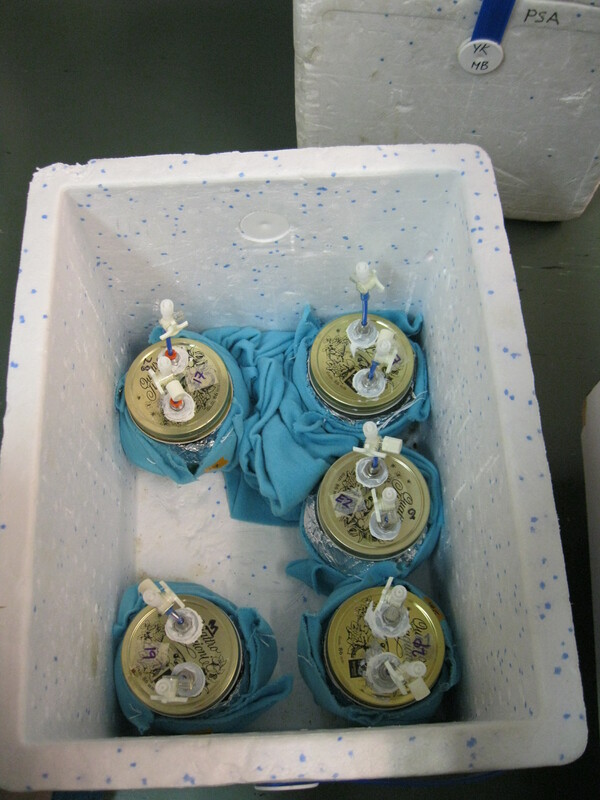 This meant assembling jar-and-lid units, wrapping the glass part in foil, and then putting each jar into a little felt ‘coat’ that I made for the jars to keep them from knocking together as they traveled in their coolers. 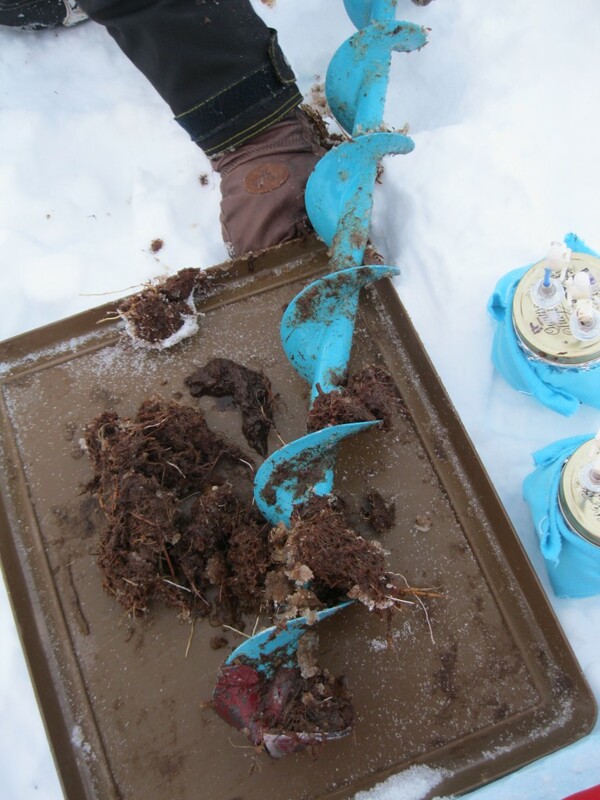 The foil is to keep sunlight out (because sunlight = microbes in the soil can perform photosynthesis, which creates oxygen, which is the enemy). 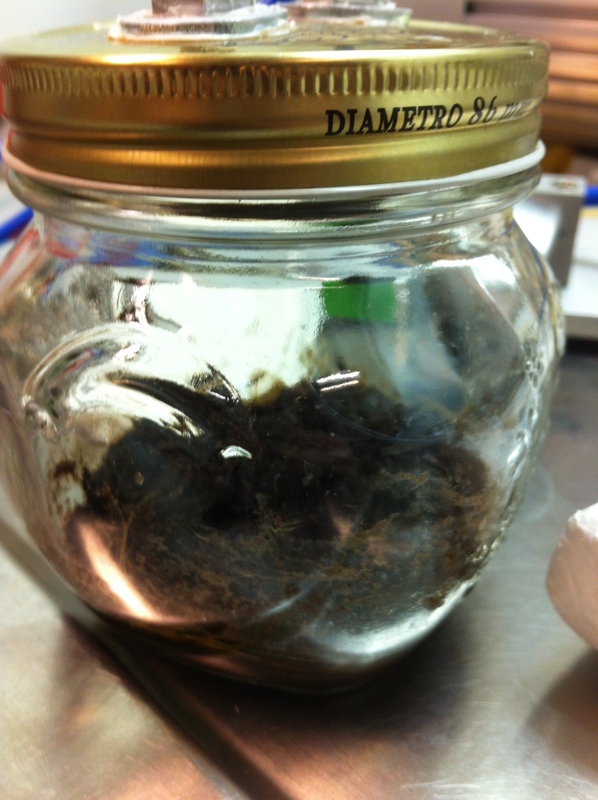 This is the amount of soil in each of the jars (about 60 grams): Okay, so once both core-quarters of soil were inside each jar, I “field flushed”. 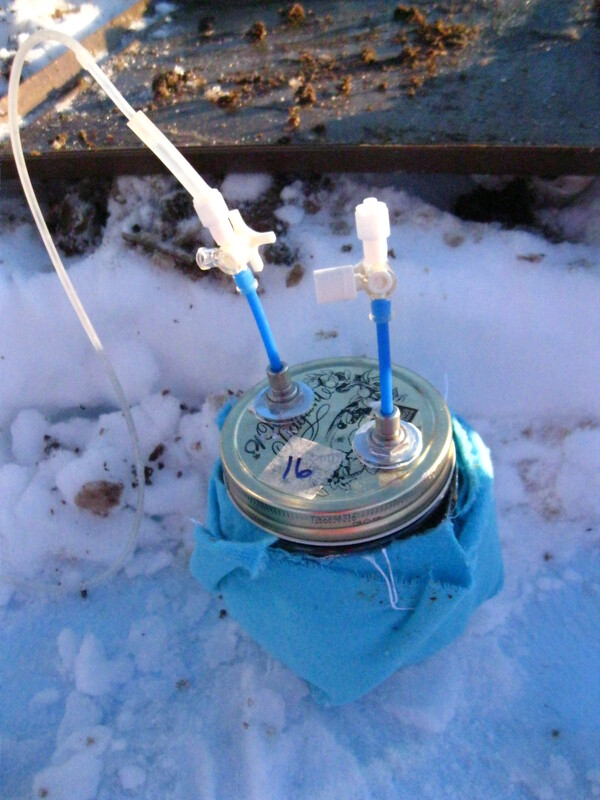 This consists of attaching some air-tight tubing from the N2-gas tank to one of the stopcocks on the lid of the incubation jar. You then allow the oxygen-free N2 gas to overfill the headspace, then open the second stopcock on the lid, and allow the N2 gas to flow through and ‘flush’ out the jar’s headspace. Tada! Each jar was flushed for 5 minutes in the field, then tucked back into their coolers to prevent them from exposure to photosynthetic sunlight. After each foursome is flushed and stored in their cooler, we would move on to the next two soil cores, fill four more jars, field flush the jars, and so on and so forth. Until all the jars were filled and flushed! 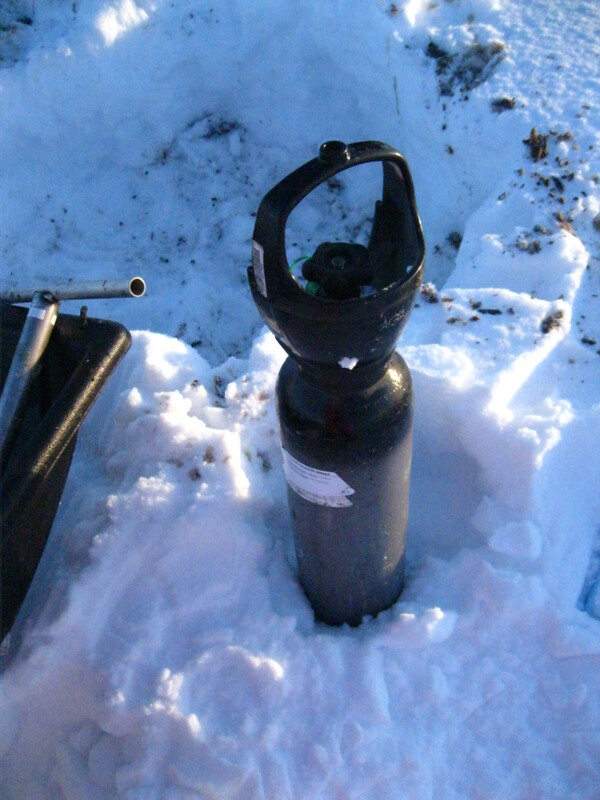 Once I got back to the field station, I flushed all the headspaces with the same tank of UHP N2 gas for another 5 minutes (in case the jostling of the walk and car ride released some oxygen-filled gas bubbles from the peat soils), and tucked them more securely into their coolers for the much longer ride back south. Whew. Two days on a bus later, and the jars and I are back in Kuopio! 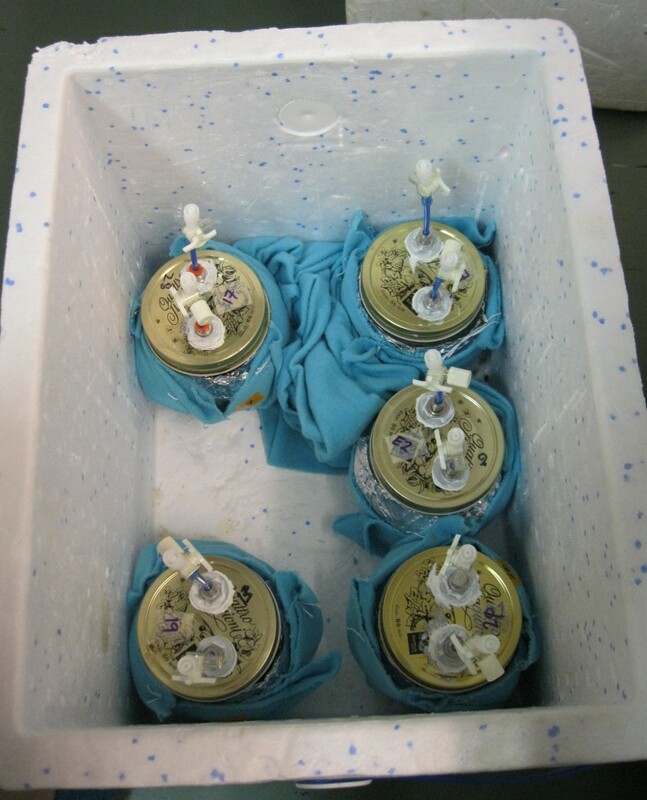 The coolers were all stored in the bottom of the bus, which is the same temperature as outside and colder than your standard fridge, and some of the soils had partially frozen, so I put all the jars into a 10C fridge and allowed them to ‘thaw’ for a day. Then began the more serious business of laboratory headspace flushing. 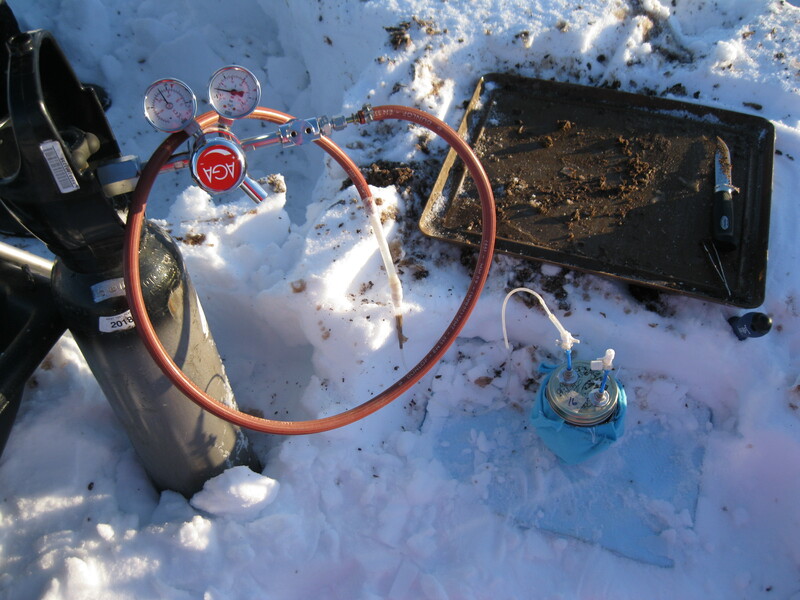 This involves my favorite piece of equipment I’ve worked with in Finland: a flushing and evacuation manifold! 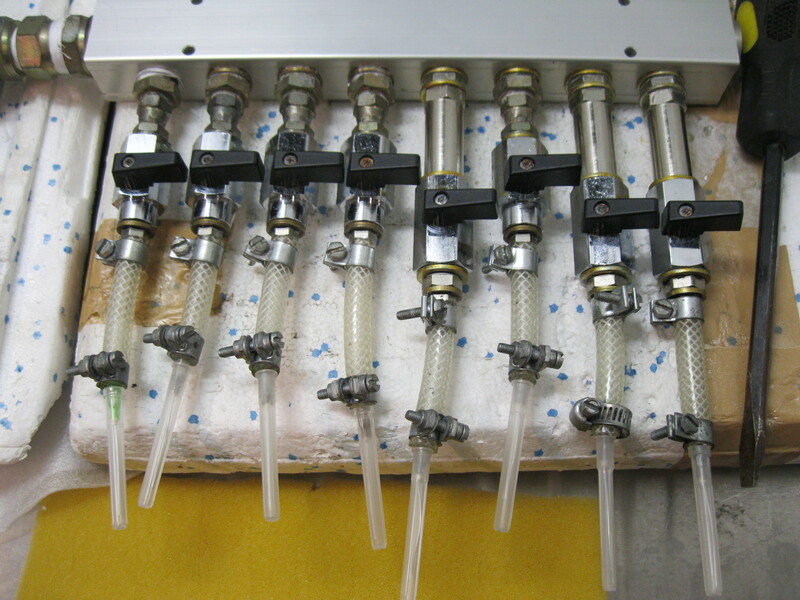 The gray thing with orange and clear tubes coming out of the top is a pump, connected to the red-handled controller. 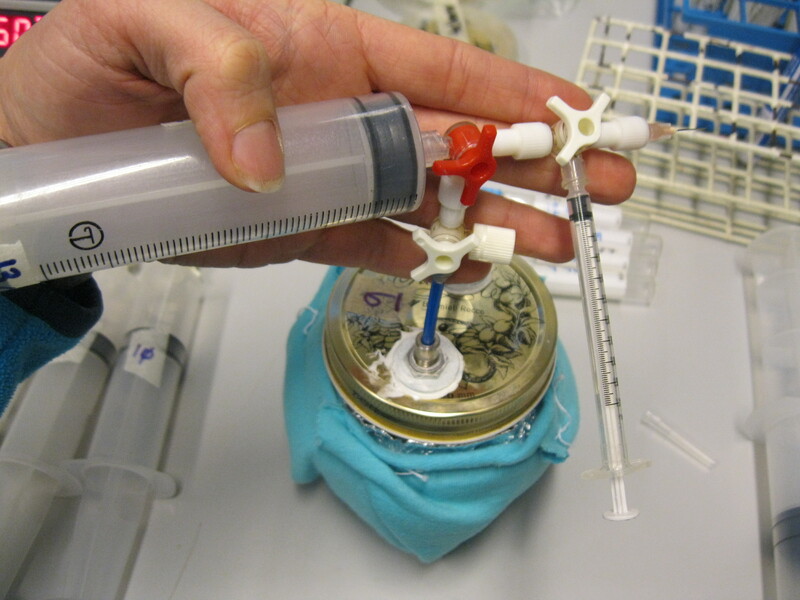 The controller is also attached to a large tank of UHP N2 gas (same stuff that I had in the field-sized tank), and you can use that shiny red handle to direct either N2 gas or suction created by the pump through to all of the ‘stations’. Both the gas tank and the pump can be in ‘on’ mode at the same time, so you can seamlessly switch between flushing with N2 and vacuuming, all with a simple twist of that red handle (kinda like a railroad switch). Each of the line’s stations can also be controlled by a toggle at the top of each station line (all of the ones shown here are equipped with needles at the moment). So much control! 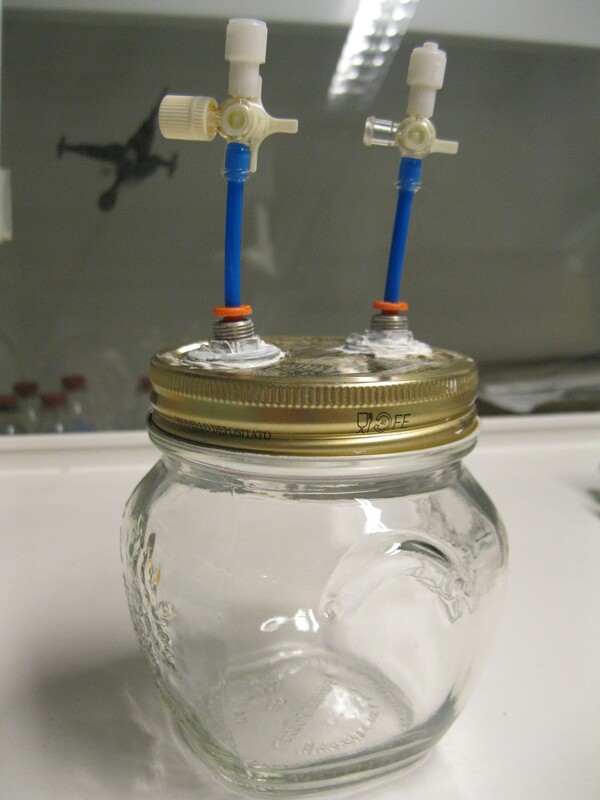 So this is literally the best-possible setup for jar headspace flushing! I replaced one of the needles on the line with some flexible tubing attached to a stopcock (which can easily attach to one of the stopcocks on top of the incubation jars), and away I went! I did 3 rounds of laboratory flushing: 1) the day after the jars and I arrived, to rid the headspaces of any lingering O2, or any that had been produced or released during our days of travel. 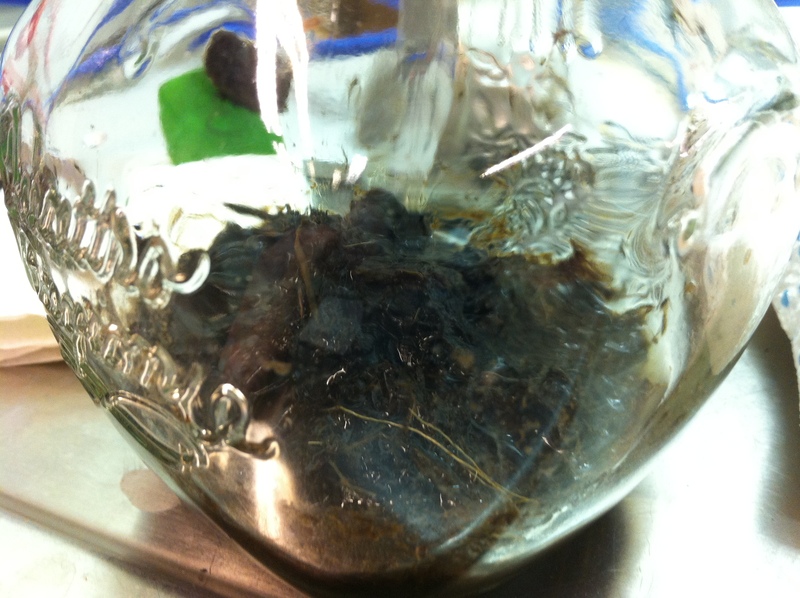 2) Three days after the initial lab flushing session – this second flushing was done after I took a sample of the headspace and analyzed it, because I theoretically had a measurement at that point of all the gases that had been created by the soil in 72 hours! 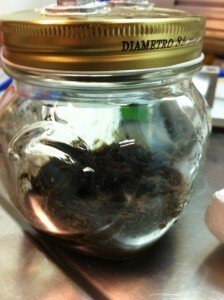 And 3) immediately following soil treatment solution introduction, and immediately prior to headspace manipulation (see below), I did a round of particularly long and rigorous flush-vacuum cycles, ending with bringing the headspaces to atmospheric pressure to ready them for the beginning of the experiment. After a little algebra to determine the mixing ratios I needed, I added specific amounts of pure 13C-CH4 and then pure 12C-CH4 into the bag. Voila! 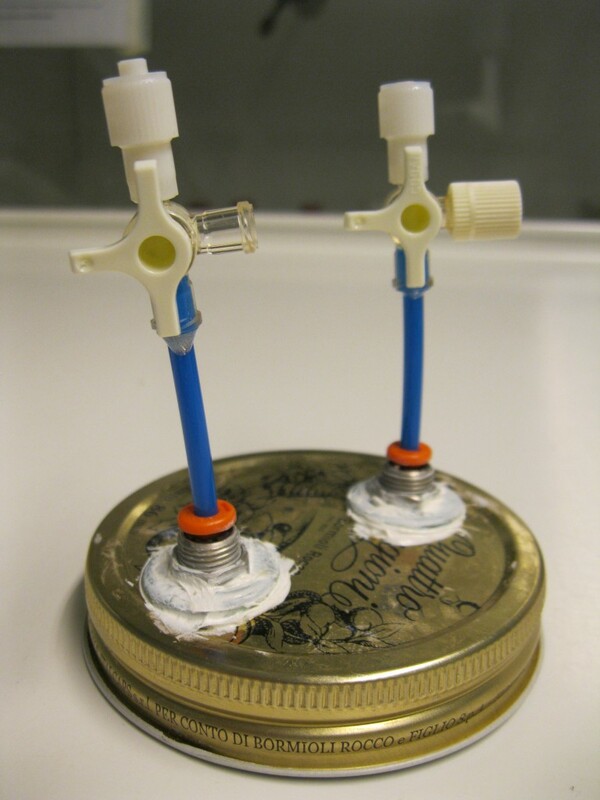 A gas reservoir from which to draw all my individual jar headspace spikes (isotope amendments are often called ‘spikes’, just like spiking a bowl of punch). In a nutshell: I am adding labeled 13C-CH4 and then measuring to determine the activity rates of both AOM and methanogenesis. (1) AOM converts the 13C-CH4 I put in the headspace into CO2, so it will show up in the headspace as 13C-CO2. 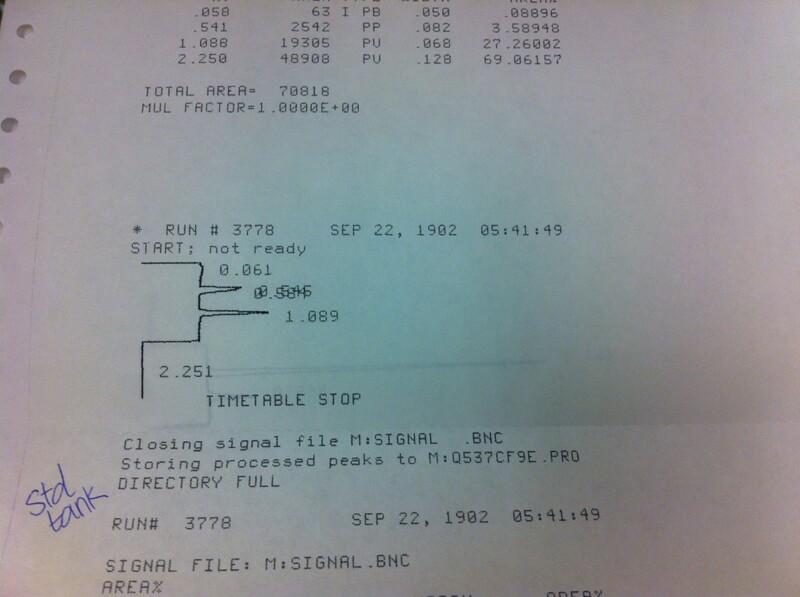 I measure the amount of 13C-CO2 appearing in the headspace over time, and that is how I determine the rate of AOM. (2) The rate of methanogenesis can be determined by the change in both the mass and isotopic signature of methane in the headspace. 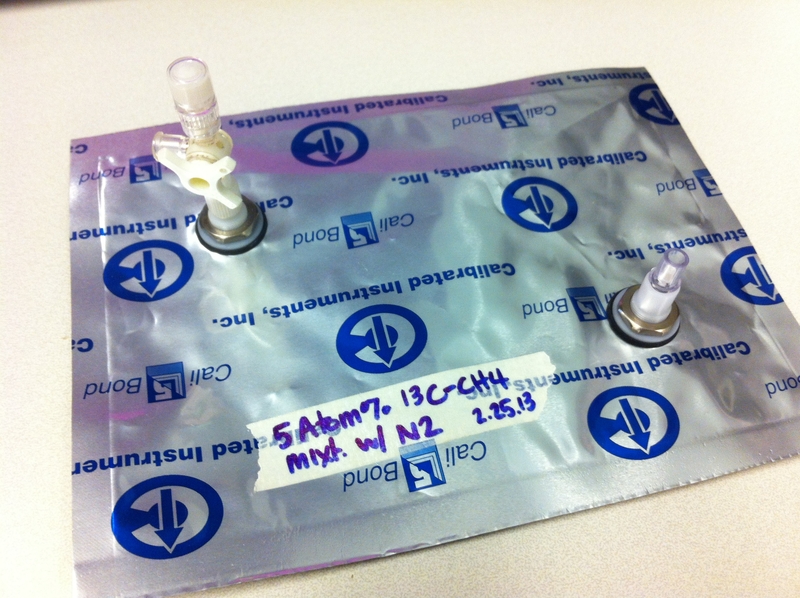 Newly-made methane will be 12C-CH4, and will increase the mass of CH4 present. I measure the mass and ratio of 12C- and 13C-CH4 in the headspace, and calculate how much of it has come from new methane (rather than the methane I put in the headspace to begin with). The magic of math! Now everything is ready to start the experiment! 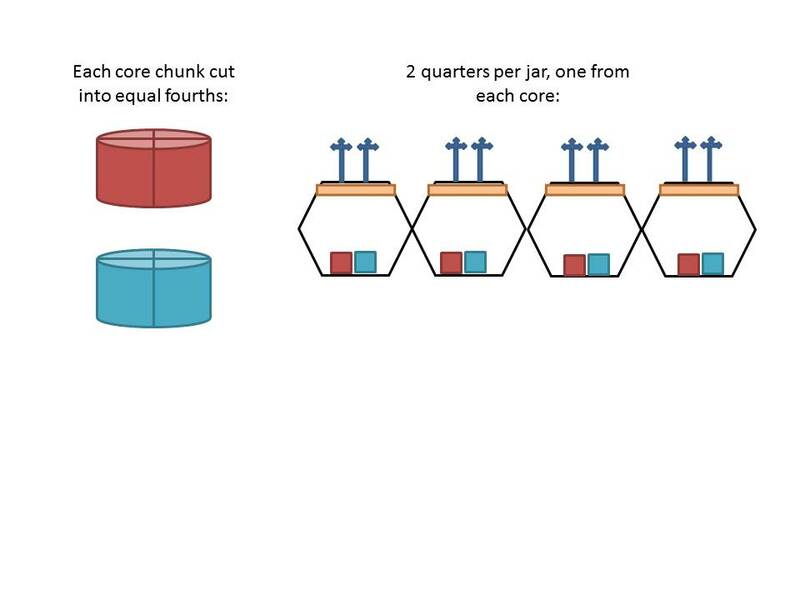 Each jar must receive, in this order: (1) it’s randomly-assigned treatment solution, (2) a brand new headspace of only UHP N2, and (3) a methane isotope spike. A ‘Time 0’ sample of the headspace must be taken about 5 minutes after adding the spike, so that I have an ‘initial’ signature for each jar individually, to account for any/all jar-specific differences in the starting conditions. Muwahahaha! Success (at least at starting…)! This is where a little fancy fingerwork with the 3-way stopcocks is crucial. Stopcocks are awesome, but I have to use them properly to keep from inadvertently adding any ambient air into the jars while sampling. Rule #1 with the stopcocks and keeping things anaerobic: half-turns. If you’re twisting the stopcock controller in full 90-degree rotations, you’re allowing gas to enter the tiny, tiny spaces inside the stopcock valve. This means that if you use 90-degree rotations to close them, the next time you use that stopcock flow route, you introduce whatever gas is inside that section of the valve itself. To combat this infuriating bit of gaseous physics, you use 45-degree rotations, so the tiny spaces inside the valve are never open to flow until you want them to be. 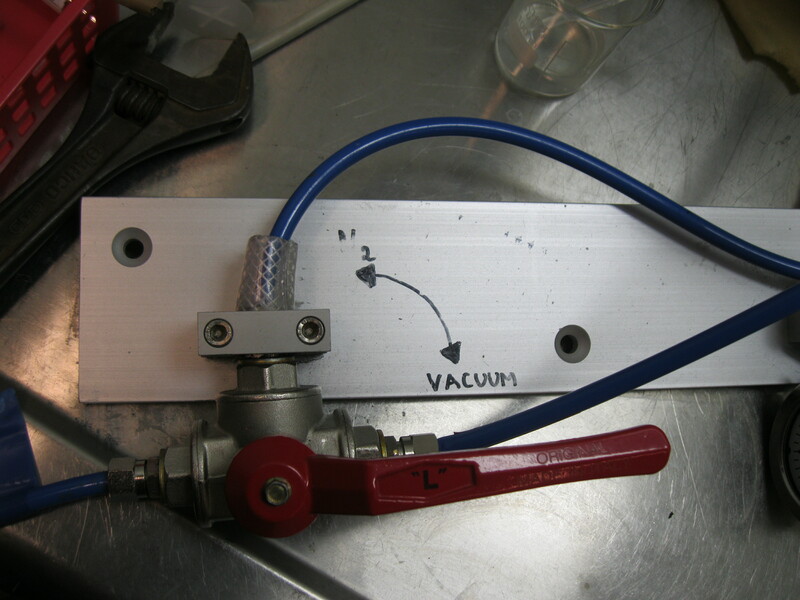 So you can make sure the connection is anaerobic before you open and close the valve. 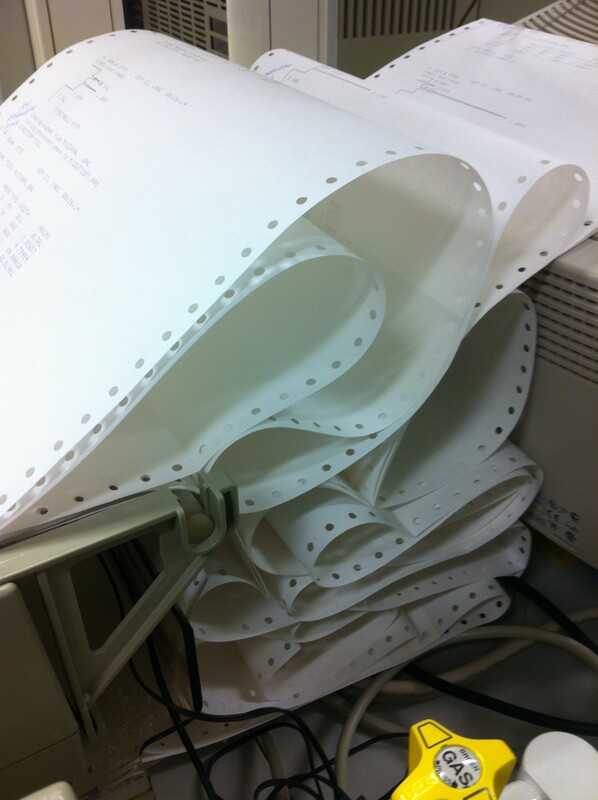 This entry was posted in Kuopio, SCIENCE! by Kim. Bookmark the permalink. Wow. There is so much science in there I don’t know what to do!